Gregory's smile in scene 10 though.... Amazing! HELP, THIS IS TOO AWESOME FOR MY EYES!!! Really good! Can't wait to see the whole thing! Nice job! Scene 31: Action Gregory reluctantly nods his head. Scene 32: Action Gregory looks away as the others look at Raven. 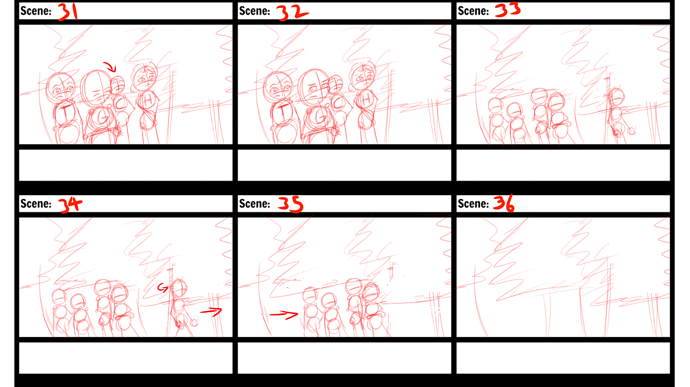 Scene 33: Camera Cuts to profile of the group and Raven, Wide Shot. Action Raven is looking back at the group, while they look at her. 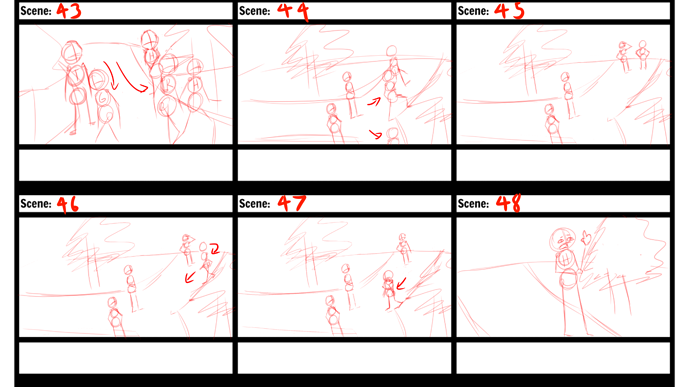 Scene 34: Action Raven turns to face the right, and walks off-screen. Scene 35: Action The group follows her and walks off-screen. Scene 36: Camera Stays on woods a few moments after group walks off-screen. 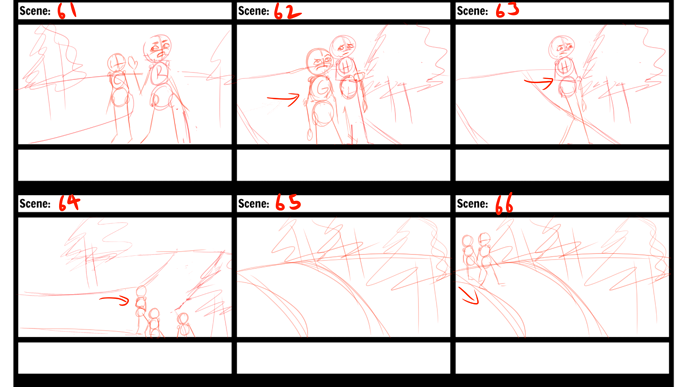 Scene 37: Camera Cuts to dirt fork road in the forest, Wide Shot High Angle. 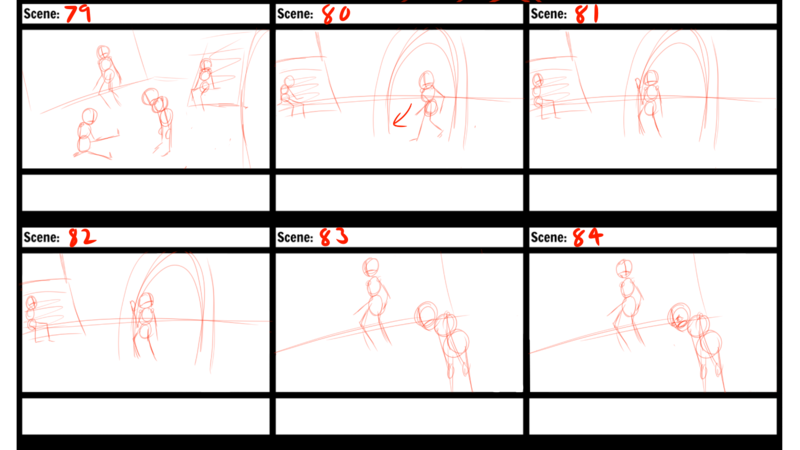 Scene 38: Action Raven walks to where the road splits. Scene 39: Action Heather and Trinian walk up and stop beside Raven. Scene 40: Camera Cuts to front of the trio, Wide Shot High Angle. Action Raven places her hands on her hips as she looks at both paths. Celosia and Gregory catch up, stopping behind the others. Scene 41: Camera Cuts to the front of the group, Medium Shot High Angle. Action Celosia makes her way to Raven at the front, and Heather steps back to allow her through. Dialogue Celosia: What way do you think the crate is? There's a dock on each beach. Scene 42: Dialogue Raven: Yeah, I know that. I'm wondering if we should split up and check each path. Scene 43: Action Raven and Celosia begin to walk down the left path off-screen, and Gregory walks down the right path off-screen. Heather and Trinian quietly wait and watch. 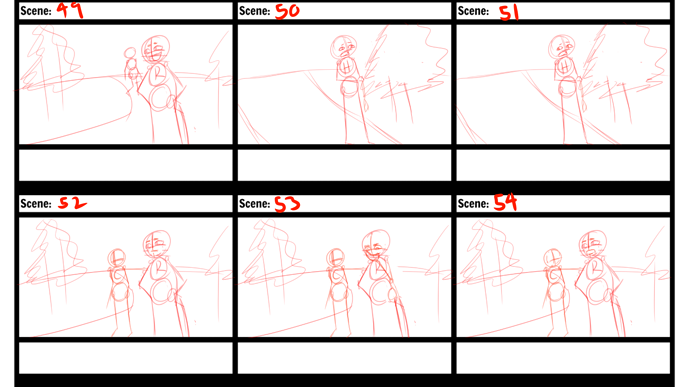 Scene 44: Camera Cuts to side of the fork road, Wide Shot High Angle. Action Raven and Celosia continue to walk down the left path on-screen as Gregory continues to walk down the right path off-screen. Scene 45: Action Raven and Celosia pause at the edge of the left path. Celosia puts her hand over her eyes to see, as Raven again places her hands on her hips. Scene 46: Action Raven turns around, and walks back to Heather and Trinian, while Celosia stays in place. Scene 47: Action Raven continues to walk toward Heather and Trinian, speaking before she reaches them, and Celosia sets down her hand as she continues to look down the path. Scene 48: Camera Cuts to face Heather, Medium Shot. Action Raven is cut off by Heather as she meekly raises her hand. Dialogue Heather: Hey, um, Raven, can I suggest something? Scene 49: Camera Cuts to face Raven, Medium Shot. Action Raven has her hands on her hips, she kindly smiles at Heather. Celosia begins to walk back to the group. Dialogue Raven: Of course, go ahead, but quickly. Action Heather lowers her hand while she grips her arm with the other and hesitantly continues. Dialogue Heather: I don't necessarily think we should split up. Scene 51: Action Heather looks to the right. Dialogue I think we should all go right. Scene 52: Camera Cuts to face Raven, Medium Shot. Action Raven's smile slowly drops as she looks at Heather. Celosia is now beside Raven. Scene 53: Action Raven's eyebrows furrow and she places her hand over her mouth and chin as she thinks. Scene 54: Action Raven places her hand back on her hip, and her eyebrows slightly unfurrow. Celosia looks at Raven as she talks. Dialogue Raven: Okay. Let's go with that. Scene 55: Camera Cuts to face Heather, Medium Shot. Scene 56: Action Gregory blatantly moves into the shot, upset, his hands are outstretched in emphasis. Heather's smile quickly drops when she sees him. Scene 57: Action Gregory is now in front of Heather, but not blocking her from view. He holds out his hands by his side for further emphasis. Heather looks away, embarrassed, as Gregory speaks. Dialogue Gregory: Rave, she's the new girl, remember? Scene 58: Action Gregory raises one eyebrow as he lifts his hand, palm open. Dialogue Gregory: Plus, why would we want to all go right? It would be better to split up. Scene 59: Camera Cuts to face Raven, Medium Shot. Action Raven gets an annoyed look as she addresses Gregory. Celosia continues to watch. Dialogue Raven: First, stop calling me Rave, I don't like that. Scene 60: Action Raven raises her eyebrow. Dialogue Raven: Second, she deserves to be given a chance. We can always go back. 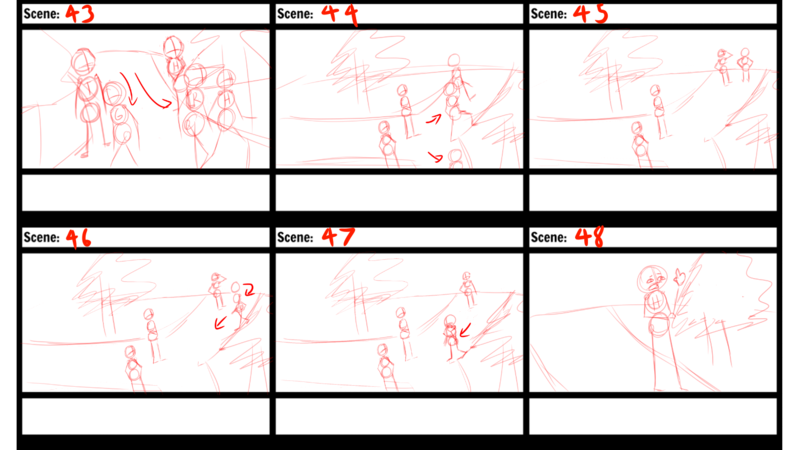 Scene 61: Action Raven holds her hand to gesture for the others to follow her as she walks to the right. Dialogue Raven: Com'on everyone, we're going right. Scene 62: Camera Cuts to face Heather and Gregory, Medium Shot. Action Gregory looks annoyed as he rolls his eyes, and follows Raven off-screen. Heather hangs back a moment as she watches him, still embarrassed. Scene 63: Action Heather shyly follows off-screen, looking down. 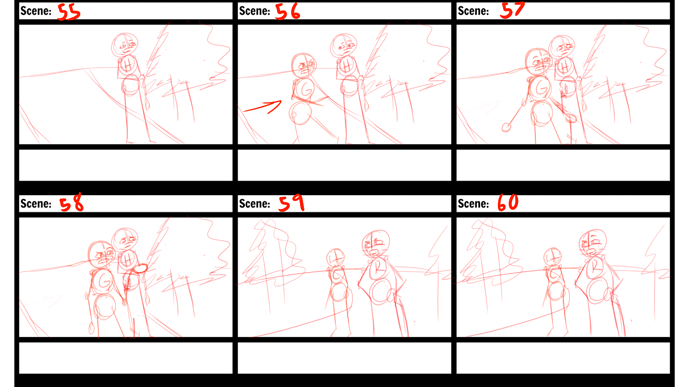 Scene 64: Camera Cuts to side of the fork road, Wide Shot High Angle. Action The group is walking on the right path off-screen. Scene 65: Camera Cuts to a turn in the fork road, Medium Shot, High Angle. Scene 66: Action Raven is leading the group round the turn, looking behind her. Scene 67: Action Raven turns her head, she silently gasps and her eyes widen as she stops in place, signaling to the others with her arm to stop as well. Gregory isn't paying attention and keeps walking. Scene 68: Action Gregory accidentally bumps into Trinian, pushing him into Raven. This pushes Raven forward. Scene 69: Camera Cuts to the back of Ace, Medium Close-Up. Action Ace has his hands on his hips as he is standing in front of a large group of automatons, unaware of the group behind him. Scene 70: Action Raven stumbles into Ace, which causes him to stumble forward. Scene 71: Action Surprised, Ace looks behind him. Raven has moved off-screen. Scene 72: Action Ace's expression changes to a scowl as he sees the group. Scene 73: Camera Cuts to the group, Medium Shot. Action Raven is trying to balance herself as she looks at Ace, the others are frozen with wide-eyes behind her. Still staring at Ace, she yells to the group. Scene 74: Action The group sprints back in the direction that they came from. Scene 75: Camera Cuts to face Ace, Medium Close-Up. Action Ace scowls further as he watches them run. Scene 76: Action Ace simply turns his head back to the automatons, who have remained stationary. 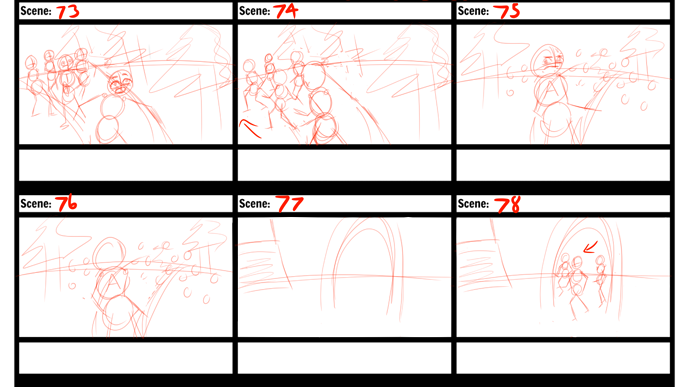 Scene 77: Camera Cuts to the entrance arch from Bootleg Pass to No Man's Landing, Wide Shot. Scene 78: Action The group runs through the arch to the left, exhausted. Scene 79: Camera Cuts to the area in front of the two entrances, Medium Shot. Action Everyone in the group has stopped here except Raven, who has not come yet. Utterly exhausted, they gasp for breath as they rest. Trinian leans against a wall, Celosia is sitting on nearby stairs, Gregory is bent over, and Heather is sitting on the ground. Scene 80: Camera Cuts to the entrance arch from Bootleg Pass to No Man's Landing, Wide Shot. Action Shortly after the others, Raven runs on-screen, also exhausted and gasping for breath. Scene 82: Action Raven looks behind her for signs of Ace and his automatons. Scene 84: Action Without lifting his head, Gregory glares at Heather. Trinian looks at him as he talks. Dialogue Gregory: Nice going, Heather. Scene 85: Action Trinian, in turn, frowns at Gregory. Dialogue Trinian: Don't be so hard on her, she's new. Action Raven is still supporting herself with the arch, but is looking at Heather, disappointed. Dialogue Raven: We'll talk about this later, Heather. Scene 87: Camera Cuts to face Heather, Medium Shot. Action Heather looks at Raven. Scene 88: Action Ashamed, Heather looks away. Scene 89: Camera Cuts to face Chris and Renna in Alexander's basement, Medium Shot. Action Chris is kneeling on the floor, hammering a nail into a crate, while Renna is sitting criss-crossed, picking up a nail. 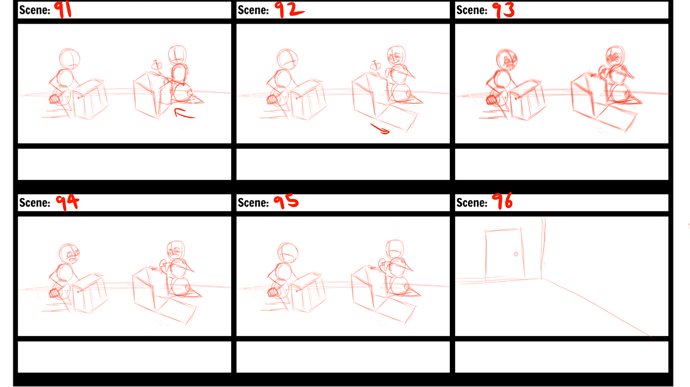 Scene 90: Action Renna reaches down to pick up a side of the crate to nail down. Correction: Alexander's Basement should be changed to the Beacon, as they are currently upstairs. 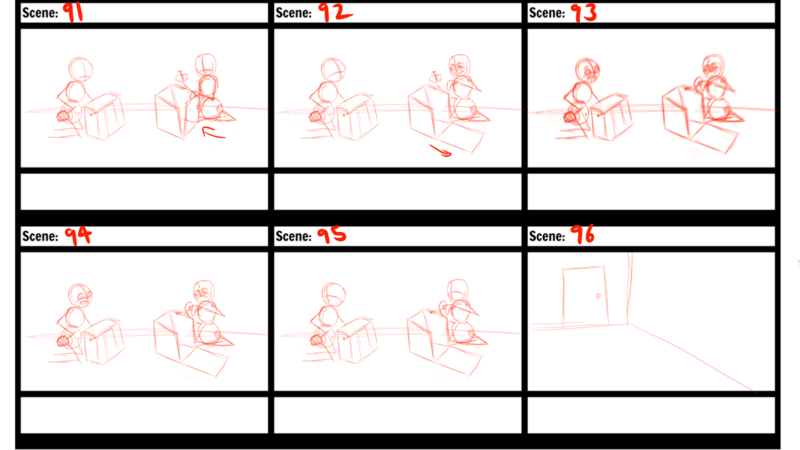 Scene 91:Action Renna raises the side of the crate. 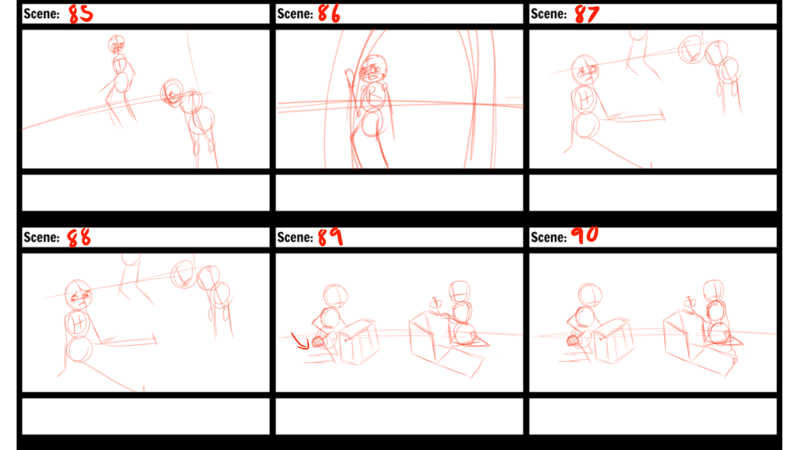 Scene 92: Action Renna cries in pain, letting the side of the crate fall back down. Chris looks up at her. Renna examines her hand with furrowed eyebrows. Dialogue Renna: Ugh, I got another splinter. Dialogue Chris: Well, you could have went out with the scouting party. Scene 94: Action Chris looks down thoughtfully. Dialogue Chris: Speaking of them, I hope Raven can bring back that crate. Scene 95: Action Chris and Renna both turn their heads as a knock is heard from the far left side of the room. 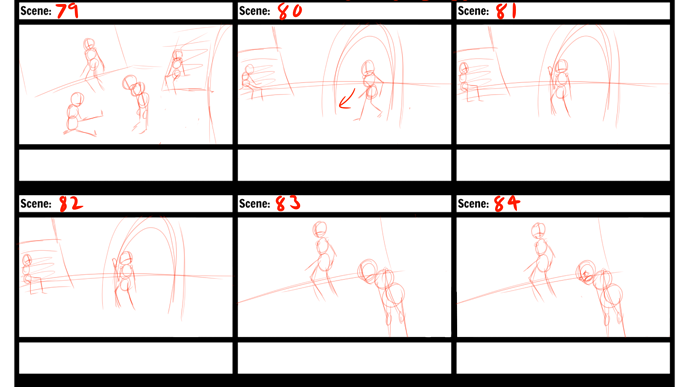 Scene 96: Camera Cuts to door that leads into the Beacon, Wide Shot. Action Chris and Renna continue to stare in the direction of the knock, unsure of what to do. 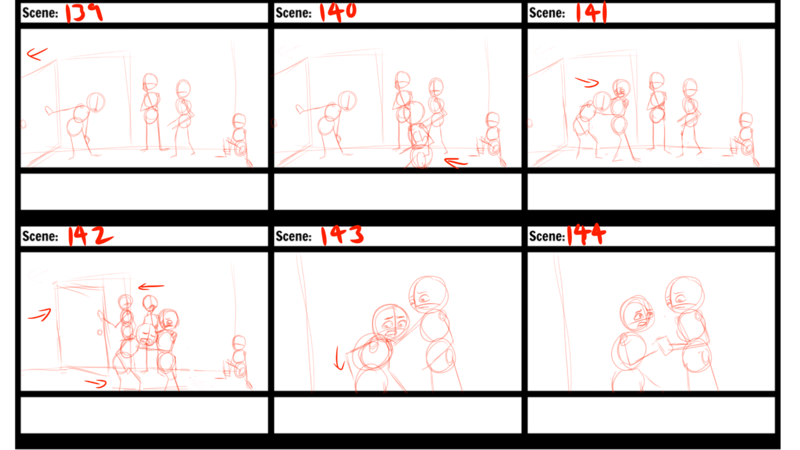 Scene 98: Action Chris puts down his hammer as he slowly gets up while still staring at the door. Renna watches him. Scene 99: Action Chris stands in place staring at the door, hesitant. Scene 100: Action Chris turns to Renna, and signals with his hand for her to stay quiet. Scene 101: Action Chris puts his hand back down. Dialogue Chris: I'll answer the door. Scene 102: Action Renna looks at Chris. Action Renna picks up her carpenter hammer and reaches it out to Chris. Dialogue Renna: Take this hammer with you, just in case. Scene 103: Action Chris silently looks at the hammer with disdain. Scene 104: Action Chris reaches to get it. 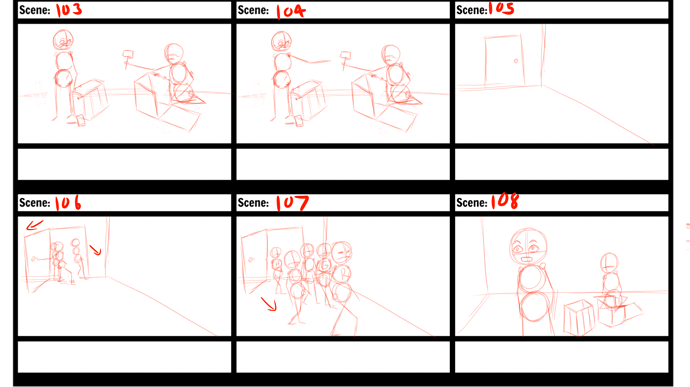 Scene 105: Camera Cuts to door that leads into the Beacon, Wide Shot. Scene 106; Action Before Chris can take the hammer, the door bursts open, and the defeated group appear with Raven leading. Scene 107: Action The group files in with sour expressions, except Heather who is still visibly embarrassed. Action Chris and Renna look at them with slight surprise. Dialogue Chris: Did you get the weapons? 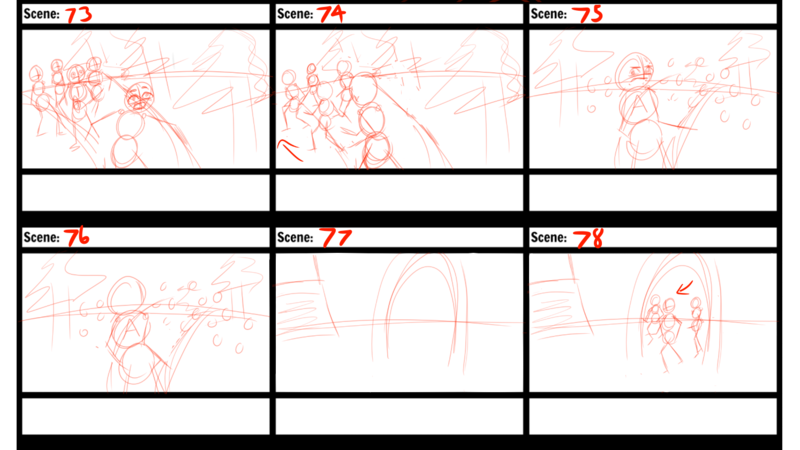 Scene 109: Camera Cuts to the docks in Evergreen Meadows at dusk, Wide Shot. Action An indistinct figure is seen in the shadows holding a transmitter. Action The figure is talking into his transmitter. Dialogue Figure: Yes, Emporer, it's all taken care of. I see the dynamite on the dock and will blow it up once General Ace arrives. Action The figure let's out a chuckle. Dialogue Figure: Yes, that little Resistance has no chance at all, I guarantee it. All right, thank you sir. Scene 111: Action The figure clicks off his transmitter and lowers it from his mouth. He slyly smiles. Scene 112: Camera Cuts to the Beacon, facing Raven and Chris, Medium Close-Up. Action Chris is visibly angry, gesturing with his arms. Raven is silent as she fiddles with the contents on a table, frustrated. Dialogue Chris: You didn't even get the crate!? Scene 113 & 114: Action Chris moves his hand in front of him, both palms up, and claps the top hand down for emphasis. Dialogue Chris: Raven, I asked you to do one thing. Scene 115: Action Chris exaggeratedly points to the left with one of his hands, the other is now clenched in a fist. Raven looks away as she continues to busy herself with the table. Dialogue Chris: That was to get the crate of weapons here to HQ. Scene 116: Action Chris rolls his eyes up sarcastically as he raises both hands up. Raven furrows her eyebrow further. Dialogue Chris: But no, you just had to run into a regiment of automatons! Scene 117: Camera Cuts to the profile of Chris and Raven, Medium Shot. Action Raven quickly turns around and glares at Chris with one hand still on the table. Chris glares back with both hands in fists. They are both silent as Heather, Trinian, and Gregory watch. Scene 118, 119, & 120: Action Chris and Raven continue to stare at each other until Celosia nonchalantly walks between the two. Raven looks away from Chris and at Celosia for a moment when she walks through. Scene 121: Action Raven looks back at Chris for another moment, Chris has not looked away. 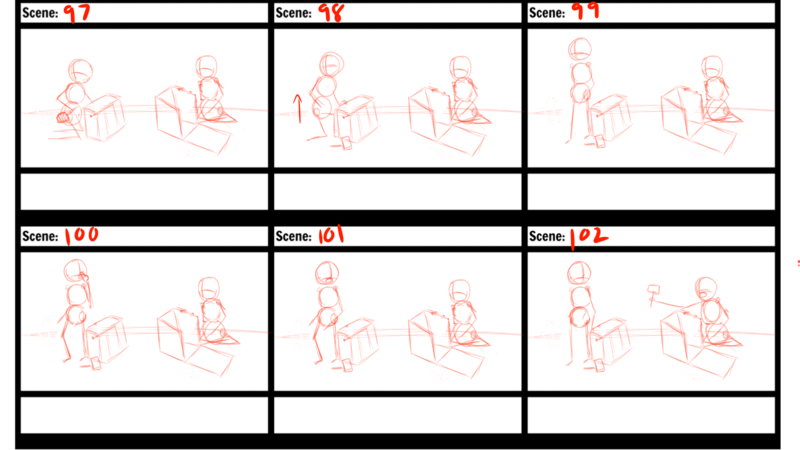 Scene 122: Action Raven turns back to the table, and holds onto it with both hands, looking down. Scene 123: Action Raven looks in Chris' direction without turning around. Dialogue Raven: I told you, I shouldn't have led the scouting party. Maybe you should have been the one to lead. Action Renna lifts her hand as she speaks, trying to end the tension. Dialogue Renna: I thought you said it was Heather's fault...? Action Raven is looking away while Chris is still looking at her until Renna speaks. Then, Chris immediately shifts his angry gaze to Heather off-screen. Raven's expression softens as she looks down, still facing the table. Scene 127: Camera Cuts to face Heather and Trinian by the wall, Medium Shot. Action Heather and Trinian have been watching Chris and Raven, and they catch Chris' glare at Heather. Scene 128: Action Heather looks away, ashamed. Trinian looks at her with sympathy. Scene 129: Action Trinian then looks at Chris disapprovingly, with his arms crossed. Dialogue Trinian: Guys, look, she made a mistake. Scene 130: Action Trinian shrugs his shoulders while raising his eyebrows. Dialogue Trinian: She didn't know the regiment was going to be there. Scene 131: Action Trinian's eyebrows furrow again as he gestures to Heather with his hand. Dialogue Trinian: She's new, for Aethasia's sake! Scene 132: Action Trinian crosses his arms again. Dialogue Trinian: If we're going to take down Lucky, we need all the people we can get. We should be glad to have her with us. Scene 133: Action Trinian looks from Chris to Raven, then back to Chris. Dialogue Trinian: We need to stop fighting and start being a team. 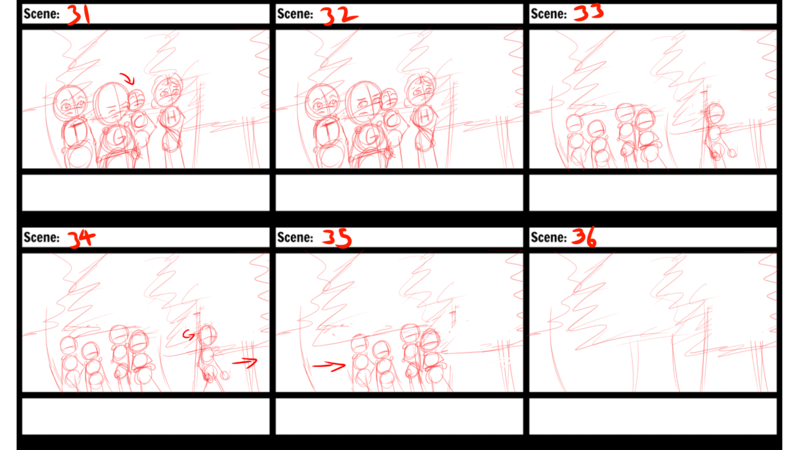 Scene 134: Camera Cuts to the entire group in the Beacon, except Celosia, Wide Shot. Action Raven has turned around to see Trinian. Gregory and Renna murmur in agreement as Heather remains silent. Action Chris and Raven look at Trinian with soft expressions. Scene 136 & 137: Action Chris and Raven nod their heads in approval. Scene 138: Action Chris, Raven, and Renna quickly turn their heads in the direction of a loud noise, surprised. Scene 139: Camera Cuts to the door that enters the Beacon, facing Heather, Trinian, and Gregory. Action Celosia has burst through the door, bent over and gasping for air. Heather puts her hand over her mouth as Trinian and Gregory move themselves a little from their resting positions in case they need to act. 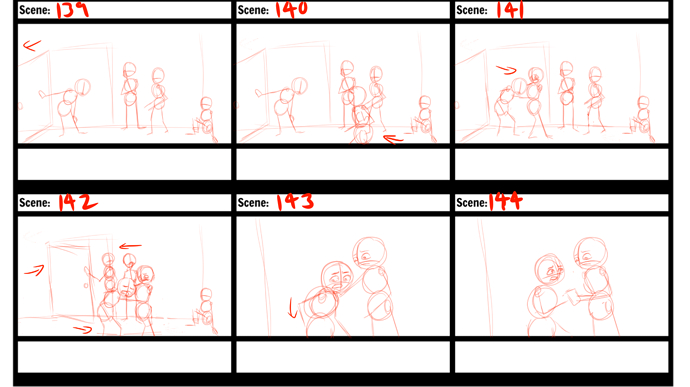 Scene 140: Action Chris runs from the right off-screen to assist Celosia. The others watch in shock. Scene 141: Action Chris helps Celosia into the room, supporting her. Dialogue Chris: What's wrong? Are you alright? Scene 142: Action As Chris and Celosia move to the center of the room, Trinian moves to close the door. Celosia is out of breath while she tries to speak. Dialogue Celosia: There...was a huge explosion...in Evergreen Meadows! Action Chris is semi-supporting Celosia now as she is still bent over. She looks to her pocket to pull something out. Scene 144: Action Celosia hands Chris a broken piece of wood, with a concerned expression. Chris looks at it, taking it with both hands. Dialogue Celosia: ...and I found this. 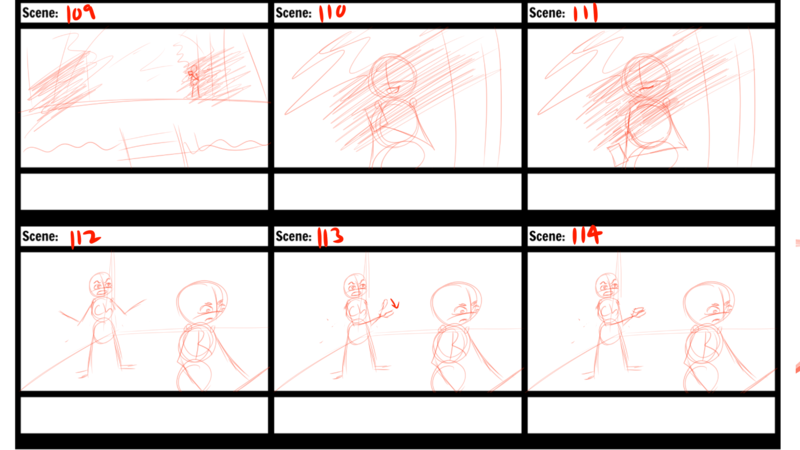 Scene 145: Action Chris silently raises his eyebrows and his eyes widen as he looks at the piece of wood. Celosia watches his response. Scene 146: Camera Cuts to view the piece of wood, Close-Up. Action Chris holds the piece of wood with the writing TNT on it. 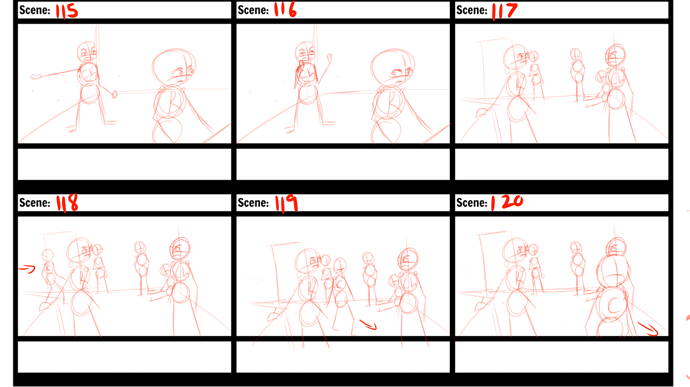 @Jane_Gogglerubble, you need to stringe all of these storyboard pictures together and make a video out of them like they do in the production of most movies. 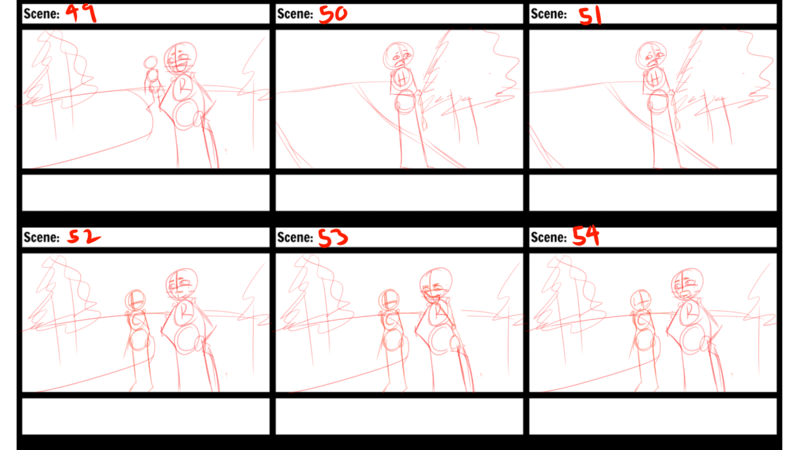 Now that the storyboard is finished, we can do backgrounds, composing, animating--all of that fun stuff! 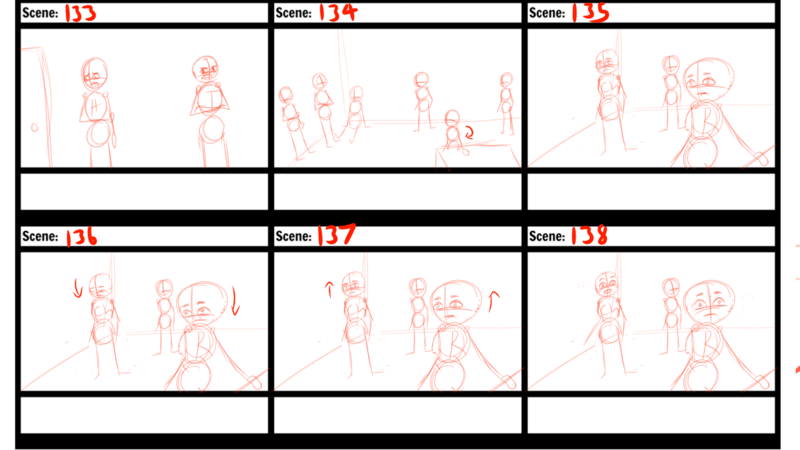 Xaloy D., May O. Cinnar R., Annaliese D.
We have about 5 animators, including myself. 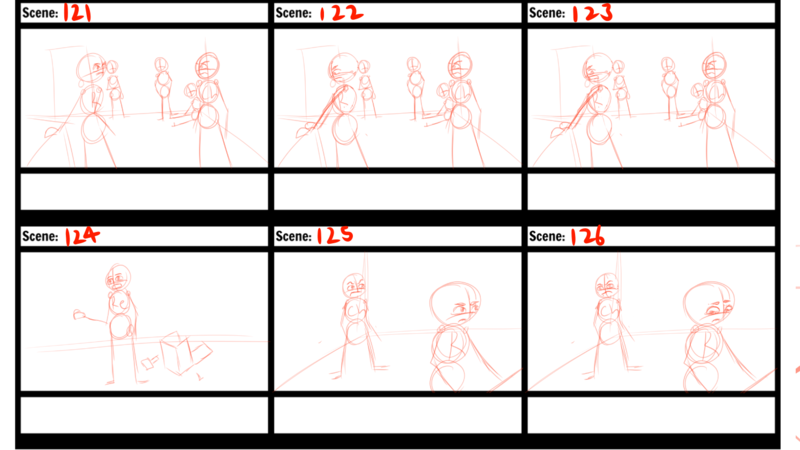 Please pick a storyboard that you would like to animate (if one is taken, please choose another, thanks!) 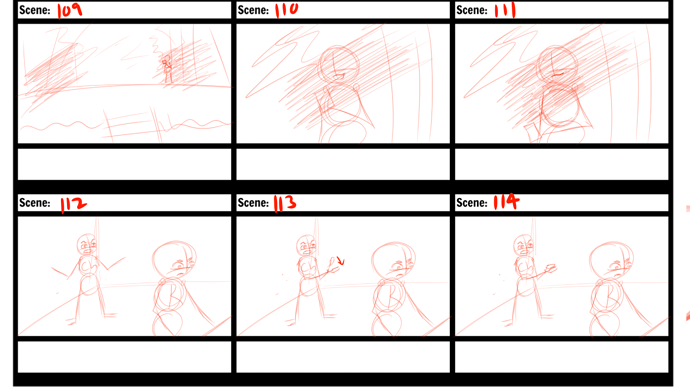 I will take any untaken storyboard. How is this going to work? 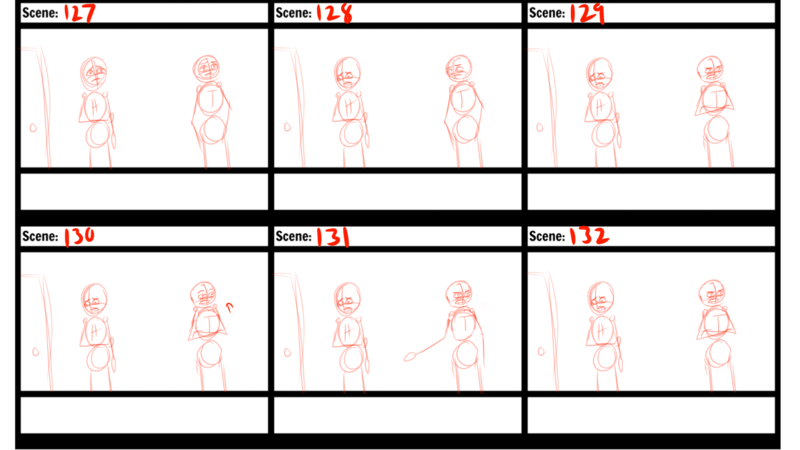 First, I should mention that you don't have to worry about coloring, shading, or lining your animation. Clean sketches will work. 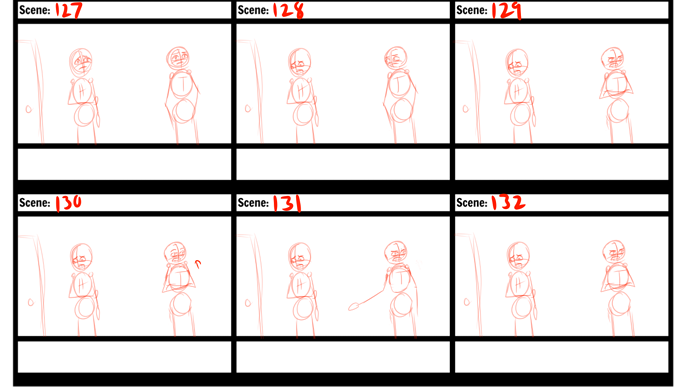 Animate the scenes that you are given based on the storyboards and descriptions. 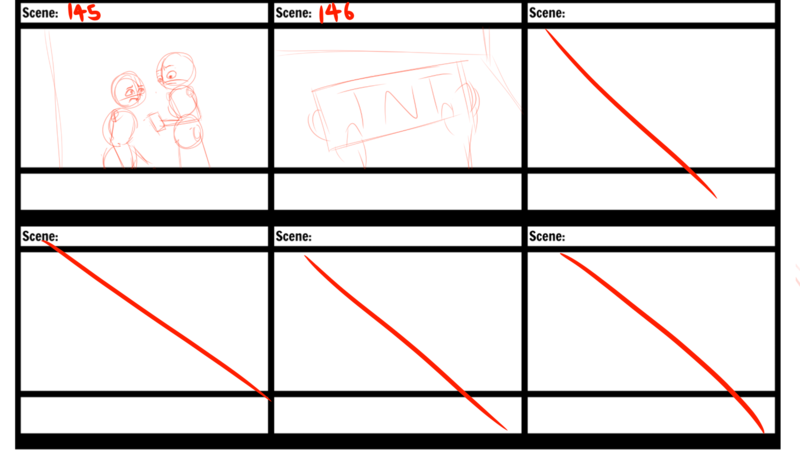 Since we can only post our work here, we'll have to convert our animations into GIFs, and then the line-artists, colorers, and shaders will have to split them back into frames so that they can do their task. There are websites that allow you to do this. 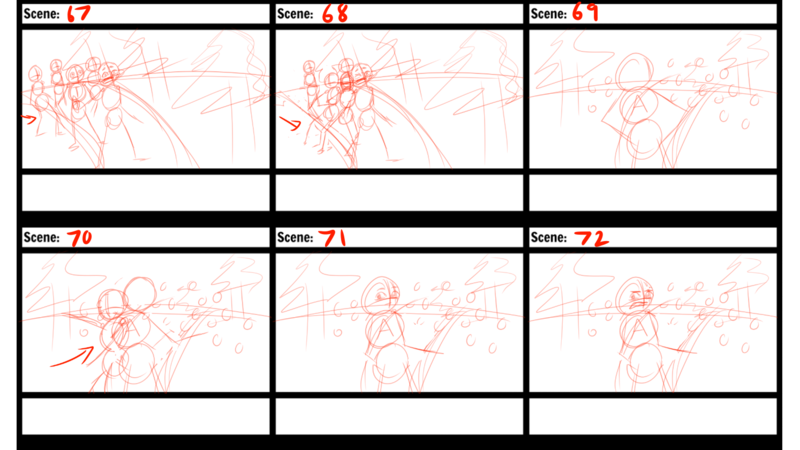 If you aren't familiar, when animating it's best to first draw what they call "keyframes," which show the extremes of an action, and then the in-between frames that makes the animation look smooth. 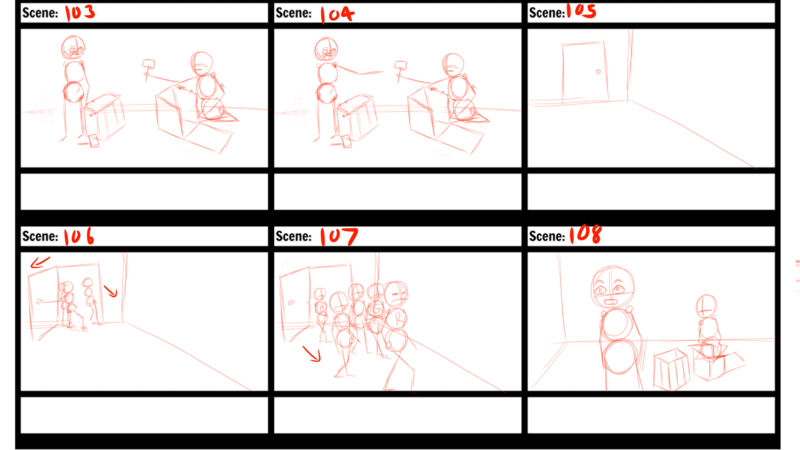 If you were to animate a bouncing ball, you would animate the ball at keyframes such as in the middle of the air, then on the ground, and then back in the air. The in-between frames would be the pictures of the ball in-between the middle of the air and the ground, then in-between that and the ground, then in-between that, and so on. There should be 10-12 frames per movement. If a character is not moving, don't worry about it, that can just be one or two frames. We'll edit them in the right timing afterwards. Since Ariella N. is unavailable to help with background art for a while, we need a couple of people to help with Bootleg Pass. @Scarlett_Darkhall and @Jacoby_Elderfun1, would you be up for it? 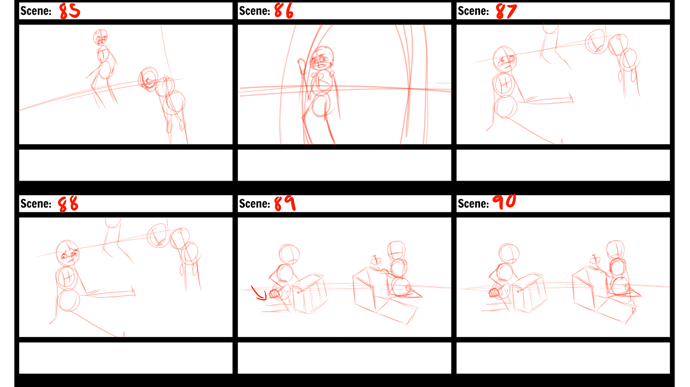 There are 14 backgrounds in storyboards 1-76. 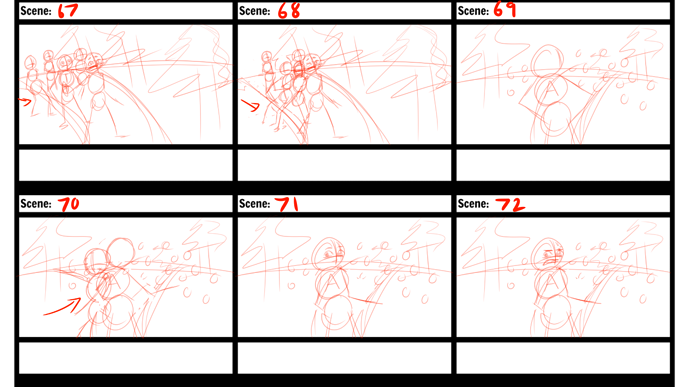 @Skybie_Jumpdust1 There are 5 backgrounds in storyboards 77-88 (let me know if you need any help with those). May O. 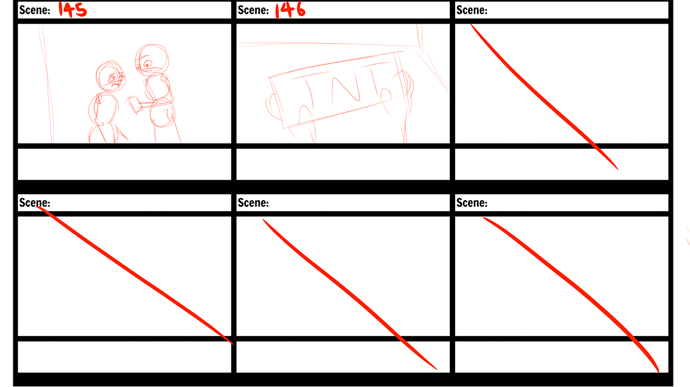 There are about 11 backgrounds in storyboards 89-146. @Hanna_Brassheart, would you be up for helping with this and also drawing the regiment of automatons in storyboards 69-72, 75, & 76? 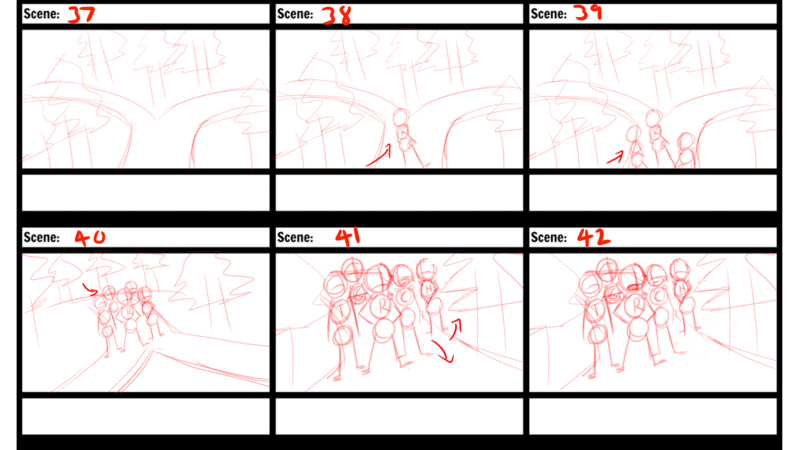 They are stationary in the scenes, so it can just be one picture for all of it. These are a lot, so don't worry about detail. It just has to resemble its Aetherlight counterpart. 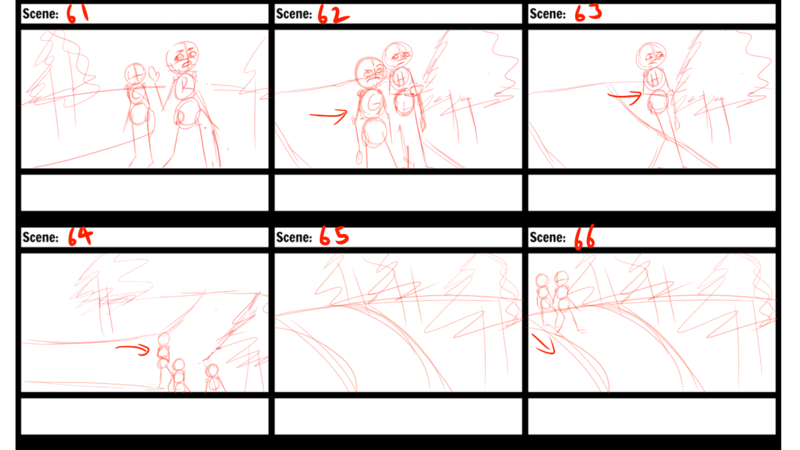 The storyboards are the best guides (some backgrounds may just be the same backgrounds cropped to focus on certain areas). @Hans_Oddcraft we'll need effects for sunlight in Bootleg Pass, shadows at dusk in the docks of Evergreen Meadows, and some dust in the Beacon, especially when the side of the crate falls if you're up for it! We'll also need music for the intro/outro, but we can do that later. @Xonos_Darkgrate1 @Gloria_Oldenpinner @Drmeh_Orangescope We need some editors for episodes 2-5 that Ilayne has posted. If Xonos wants to take the first two, then Gloria the next two, and Drmeh episodes 5 and 6 (though 6 won't come out until after we finish episode 1), that would be helpful. That's alright, @Xonos_Darkgrate1, thanks for letting me know. If @Xonos_Darkgrate1 isn't able to edit the first episode I can pitch in. Forgot to mention that the episodes that need to be editted are 2-4, not 1! Okay, I can do that, but how are we sharing this again? @Jane_Gogglerubble Awesome!! Another thing, would you mind creating an outline-type-thing for the music? Like, I know I'm doing calm music, but is it just for the forest scene? 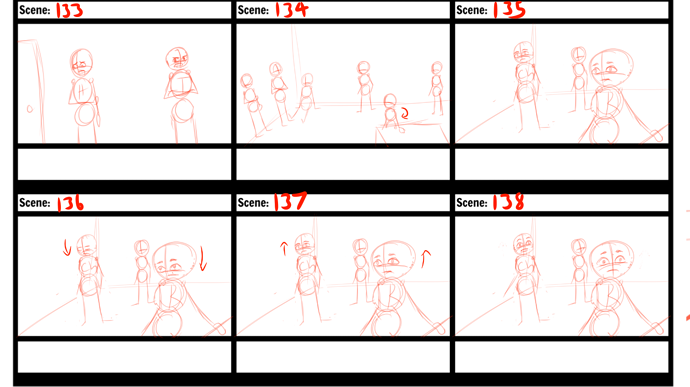 Are there more scenes I have to do/which ones? A time duration would be great as well, but we obviously don't have that yet, hehe... I'm sorry if I'm making 0% sense, I don't feel that good today... Thanks for all you're doing Jane! 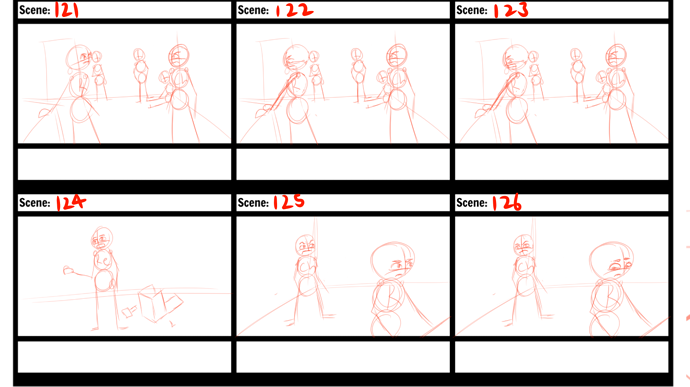 @Hans_Oddcraft The animators will be posting their work in GIFs here so that the person with the next task can deconstruct them back into frames to work on, and then repost the finished product as a GIF here. 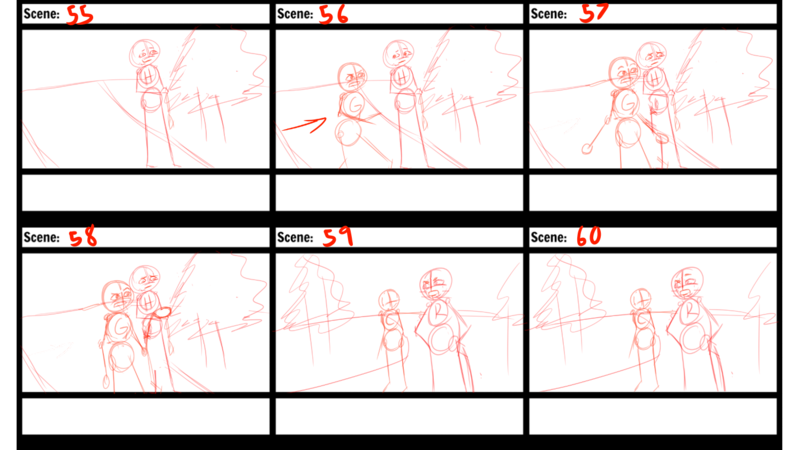 Once everything is done, I or someone else will again deconstruct the frames to edit them to the right timing. @Ilayne_Merespark That brings up a good point. It might be better if we do the animation first and then the music so that we can have the timing.